Seats 40 (private room, 18, outdoor 16). D Thu-Sun 6pm-10pm; a la carte. L Sun only 12pm-4pm. Children welcome (high chair, children’s menu); reservations recommended. 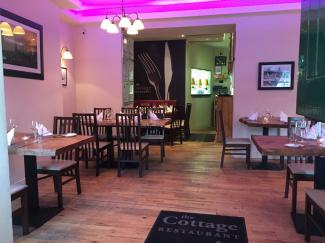 Available for private functions & bookings of 10 or more at other times. Closed Mon-Wed. MasterCard, Visa. Well known local chef, Shamzuri Mohid Hanifa, offers excellent modern European and Asian food at this cheerful white-washed restaurant on the edge of the pretty village of Jamestown and it has become a firm favourite with local diners and visitors, many of whom arrive by boat. Bright red paintwork, window boxes and hanging baskets give it an attractive cottage appearance; inside it’s cosy and uncluttered, with subtle lighting, simple, classically linen-clad tables and smartly turned out staff waiting to show you to your table. Simply worded à la carte menus credit suppliers and offer six or seven appealing dishes on each course – and there are daily specials too, reeled off by the friendly and well-informed staff. 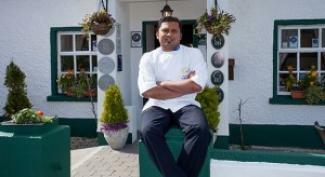 Begin, perhaps, with Tandoori style Fenagh quail with plum and onion chutney or a delicate dish of spiced monkfish with lemongrass and turmeric coconut cream – both very tasty and the cooking has finesse; although portions tend to be generous in the country, they are well-judged here to start the meal gently. Main courses are also likely to include some seafood (pan-fried fillet of Goatsbridge trout with wilted greens and fennel cream, perhaps); lamb is a favourite too, and there may be some unusual combinations - local Thornhill duck breast served with goji berry glaze, slow cooked leg dumpling with young Kim chi and miso cream sauce. Side vegetables are more imaginative than is usual in Irish restaurants – a range of potato dishes may include classic lyonnaise, diced potato with a light creamy curry sauce (a particular favourite), and some really good mash, while another late season side dish might be a tasty autumnal mixture of diced turnip, carrot and parsnip. To finish, there are farmhouse cheeses and a tempting choice of desserts, including good ice creams; an assiette of desserts makes a good choice for sharing - beautifully presented and, perhaps, including a feather light mango mousse and miniature baked Alaska. Coffee is good, and a concise, well-priced wine list includes some organic bottles and a wine of the month. Interesting, perfectly cooked, and well-presented food is the norm here, and it’s served by friendly and efficient staff - together with pleasing surroundings and good value, this makes for some memorable meals. For those arriving in Jamestown by boat, it’s about half a mile from the quay, but it’s a pleasant walk through the village - pavement all the way and past two particularly enticing pubs for a visit in each direction, perhaps. Reservations are not essential, but they are advised - this is an understandably popular little restaurant and it can be very busy, especially at weekends. On right just before entering Jamestown village.